The exhibition is nearing from the far. One week away now. Check out the 100ono blog for more! 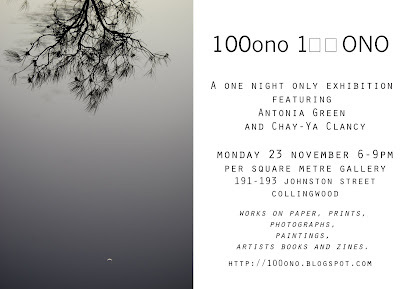 Antonia Green and I are having a ONE NIGHT ONLY exhibition of photographs, prints and paintings on Monday 23rd of November 6-9pm at Per Square Metre Gallery on Johnston Street in Collingwood. We hope you can come! The whole exhibition only goes for 3 hours! Everything is for sale. Much love. up on the spanish online magazine MY BUFFER GUEST, check it out, its exciting! Australian artist, Chay-Ya Clancy combines her fascination with language, colour and design to make public interactive art. Her installation of the Moving Letters Project at the Melbourne Writers Festival this year furthers her intention to make ‘work which intervenes, challenges, celebrates and connects community.’ It resulted from negotiations with the Festival’s co-director and attracted wide attention outside the two week event where local and international writers along with large numbers of visitors come each year. Chay-Ya’s giant freestanding boards and orange tiles with white lower case script created an ever changing mirage of letters, punctuation, words and phrases, both enhancing the celebration of language and braking it down into geometric lines and curves. The public wrote freely on the ‘Scrabble Boards’, things like, ‘listen quiet children dream aloud’, ‘melbourne audio rocks’ and ‘bs & rs e & e sh? Menus from local cafes appeared, school groups wrote their names and the act of making language became a satisfying yet transitory experience. For some time Chay-Ya has wanted to find ‘other ways to do things in the tangle of possibilities.’ After doing ten shows in two years, she headed to Berlin, where she was surrounded by a community making mess and noise and ‘changing the world one art project at a time.’ Back in Australia, Chay-Ya began chronicling the Moving Letters Project on Facebook and on her blog, stillness in flight. In developing the project Chay-Ya selected then changed fonts, case, and colour, looking at serif and sans serif font options. She put a short list on Facebook for feedback. ‘Of course everyone liked a different one,’ she says and made her own decisions. Her favourite part of the process was the application of the stickers which, to make 200 letters, became a physical dance, Zen-like in its repetition. To further document the Moving Letters Project, Chay-Ya assembled a group of performers to interact with the installation and photographed the happening. On a windy spring day the letters blew about the square and found a shape with both a deliberate and fluid forming and reforming of transient poetics. Letters were reversed, flipped and rotated; words spelt phonetically or misspelt sat along side repeated punctuation. From letters laid out in the foreground random words emerged and relationships with open ended meanings began to build. Goat/feed/toy/muse,/dead/ dented/through/aunt all appeared and then ‘through dented wey? mi ghostly aunt did swim’ came into being. As is with transience once these words found their voice they were packed up, and put away. New ideas arrived. Chay-Ya’s interest in language and art lies in the spaces between letters, the aesthetics of punctuation and seeing the collective unconscious appear and disappear. The all weather installation stood for two weeks coming in from the cold each night. Chay-Ya hopes that it will reappear and be used again. This quirky Moving Letters Project has the potential of ongoing life and each time it’s born will be an event linking language, meaning, art and people.